Guttering in Stone is one of the many services we offer at Steve Emery Roofing Specialists. Through our many years of service and experience, our roofing company has built a reputation for quality work by skilled professionals at reasonable prices. There is no flat roofing project too difficult for us because there isn’t much we haven’t seen. Your roofing system is made up of the roof, guttering, fascia, soffit, chimney and flashings. Therefore, as roofers offering comprehensive service, we specialise in all areas. Properly performing guttering is necessary to carry water away from your roof and to prevent moisture build up and seepage. Without it, your roof would not serve you well for long. At Steve Emery Roofing, we use high quality UPVC materials for gutters, fascia and soffits. For homes and commercial buildings in Stone, guttering made of UPVC is maintenance free, durable even in extreme weather conditions with a long life expectancy. The same materials are used for soffits and fascia. The whole installation will prove to be a face-lift for your property. 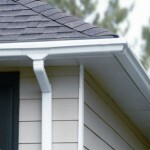 The overall appearance is greatly improved by the appearance of perfectly installed guttering. You won’t be experiencing sagging or rusty gutters. If your building is in a heavily treed area, you may need to clean the gutters every year. The UPVC material allows the gutter debris to slide along the gutter and out the downspout without resistance. A water hose should be all you need to keep your gutters clean and clear if you have trees. A strong serious storm can cause damage to guttering in stone. Because the material is UPVC the damage will likely not result in broken guttering sections . The material is strong but flexible. However, a strong wind and downed branches can carry enough force to pull the gutter away or cause anchor clips to separate causing the gutter to drop. Contact Steve Emery Roofing for all emergencies 24 hours a day. We’ll secure the waterproof properties of your roof and make the necessary repairs. Guttering left in poor repair leaves your roof vulnerable to water seepage around rafters and water build up on the roof leading to leaks. Call us for all guttering replacement and repairs. Your property will look better and your roof will last longer.